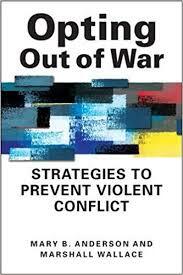 In 2013, Mary Anderson and Marshall Wallace of CDA Collaborative published Opting Out of War. The book chronicles and analyzes thirteen places where average citizens and their leaders consciously decided not to take part in a war that was swirling around them. Last week, Doug Irvin-Erickson had his introductory students work with their ideas, and they came up with some ideas that we all should consider because they can be applied back to countries in crisis today, including the United States. The book is important because it marked the first time that peacebuilders seriously considered a critical theme in public health–positive deviance. Put simply, if you look at just about any troubled system, you will find something or someone that works. So, Anderson, Wallace, and their team focused on the “outlier” cases in which entire communities chose not to take part in the fighting. Doug had his students read a short summary of their argument which they then explored in small groups. Here’s what they came up with. And what they missed which we hope they will get to this week. Understanding that they might not affect the outcome of the entire conflict, but that they could do their part by making a statement about opting out of it. The students did not have time to explore the two questions that were left hanging in the original book, which we plan to return to in class this week. Taking It To Scale. Anderson and Wallace did not ask how activists could build on what happened in individual communities and use it to build movements that could change national or global policies and political cultures. Indeed, in these days when local peacebuilding is all the rage, that is a question that needs to be posed because the “going to scale” problem does not only apply to communities that opt out of war. It applies to almost all successful projects peacebuilding NGOs have run in recent years. They make a difference in one community at one time but we have yet to learn how to turn those limited accomplishments into national one. And the US. All of Anderson and Wallace’s cases come from the Global South. In the years since their research projects were completed, we have learned that peacebuilding is important here in the Global North as well. In fact, most of Doug’s students are taking his class because they care more about Rochester NY than Rwanda and Columbus OH than Colombia. Doug (with me sitting on the sidelines) plans to ask these two questions as we head into the second half of the semester.